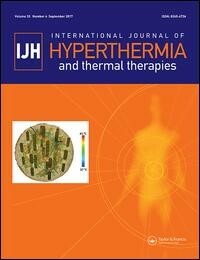 The 2015 Impact Factors have been released for the International Journal of Hyperthermia and we are pleased to report that the Impact Factor has increased from 2.645 in 2014 to 3.361 in 2015. This is an all-time record for the journal and is the first time the journal’s Impact Factor has made it into the 3s. IJH is now open access! You may access the journal HERE. The Society for Thermal Medicine is a 501(c)(3), non-profit organization whose mission is to significantly improve patient treatment outcomes by advancing the science, development and application of Thermal Therapy. 1) To encourage the advancement of thermal medicine in all areas of natural and medical sciences. 2) To facilitate cooperative research among the disciplines of physics, engineering, biology, chemistry, and medicine in the study of the properties and effects of thermal medicine. 3) To promote dissemination of knowledge in these and related fields through publications, meetings and educational symposia. Founded in 1986, STM is a premier, international scientific forum for fostering interaction and innovation in the study of biological, physical and medical applications of thermal therapy for cancer and other diseases and for facilitating a greater basic understanding of the role of temperature in cellular and molecular function. A key goal of the Society is to facilitate rapid dissemination of exciting scientific breakthroughs in thermal medicine in order to expedite the translation of both basic and applied research to the clinic for the immediate benefit of patients. The Society meets annually in the United States, (and with other international societies every 4th year) for members to exchange new research information in the areas of thermal physics/engineering, and biology and medicine, with sub-specialty interests including thermal physiology , immunology, regulation of gene/protein expression, nanoparticles and drug delivery, inflammation and metabolism, hypoxia, vascular function and the tumor microenvironment, radiation and chemotherapy sensitization by heat, thermal ablation, chemistry, and new industry development . A major emphasis at the annual meetings is placed on presentations of new translational and clinical data in thermal therapy. There are many opportunities for new investigators to present their data, and graduate students, laboratory and clinical fellows, and allied health professionals are particularly welcome at our meetings; several career development and mentor-ship opportunities are available. Among other activities, the Society sponsors CME accredited educational events, its own outstanding journal: The International Journal of Hyperthermia, a website for scientific and informational exchange, and yearly travel awards and speaking opportunities for new investigators. Using the images provided by Dennis Leeper, Chair of the History Committee, we have added a STM slideshow image archive to the Member Center. The Member Center is restricted to current members via log-in.